My students are working hard on their next science club project: bridge-building. 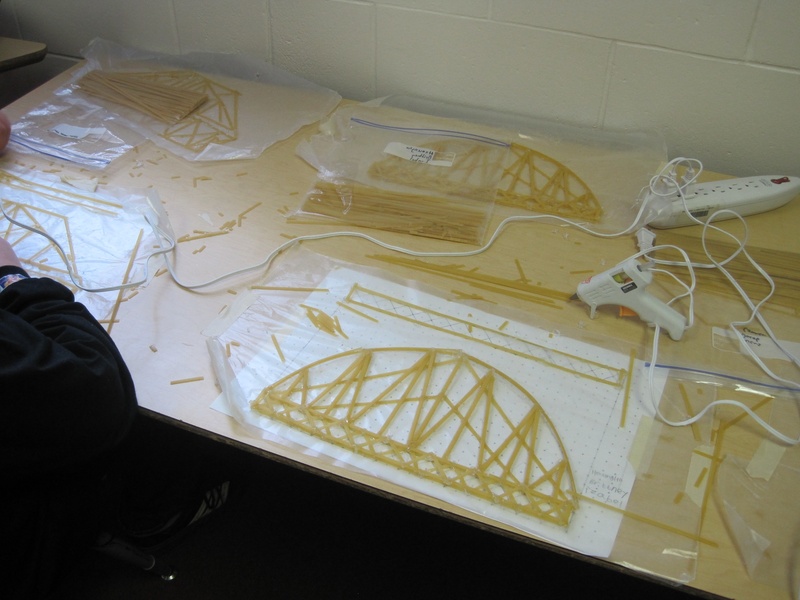 This is a project in engineering where students try and build the strongest bridge with the least amount of materials. The lesson is great as a practical way of showing engineering principles and teaching ratios, since the goal is not to make the strongest bridge but the strongest for its weight. Last year went well but my room was filled with broken ends of noodles and fluffs of hot glue for a month. I was able to find a lot of resources, however, that showed kids how bridges work. A great site—as long as it’s teacher-led, since some of it is NSFSK (not safe for school kids)—is howstuffworks.com, home of the How Stuff Works set of articles and their fantastic podcasts. Videos were found that described in detail how bridges work and are maintained. Another great resource has been a bridge-building game we found that lets kids build and test simple bridge designs. It was so addictive that we had to limit it to students who are actually in the science club. What a timely post! I am building bridges with the PEGASUS kids here in Plymouth, and I hadn’t seen that particular bridge building game. As a Plymouth Alum that’s fantastic! If you have not contacted them already CESA might have a structure tester, (http://shop.pitsco.com/store/detail.aspx?ID=2557&bhcp=1) i got mine today and it revolutionized how I test them. only downside is that I have to test them one at a time. if you wanted to email me with photos of your kid’s bridges my class would get a kick out of it!